Coaching an NFL team to do exactly what you want it do is hard work. There are 3 phases, of course, offense, defense, and special teams, and no matter how well you might fine tune and control your own work, there’s another coach on the opposite sideline scheming to ruin your day. That’s probably the hardest part of the job; trying to anticipate precisely how the opposing coach is going to ruin your day. In this game, Bill Belichick and his staff did a masterful job. Particularly so given a week of hype about “Super Bowl Rematch” and revenge narratives. This is a team that has had a target on its back going on 17 years now – they’re the regular season Super Bowl for every team – so working to train a team’s focus on the game at hand and not the external distractions is quite a skill. Notwithstanding the Falcons’ recent offensive struggles, this was a dominating performance by the Patriots. Every phase of their game worked, and worked exactly the way they wanted it to work. It’s a rare thing to see in any NFL season, and it is something to be appreciated. Special Teams. The Patriots had the ball first to open the game, and were forced to punt. The Falcons mounted a good first drive, that resulted in a relatively short FG attempt. This was a good sequence for the Falcons to assert some early control over the game. Their defense did its job on the opening drive – quelling the enthusiasm of a loud home crowd – and the offense did a good job of getting in scoring position. All the Falcons had to do now was convert a short FG with a reliable veteran kicker. Belichick had other thoughts. Recently acquired DE Cassius Marsh sliced through the Falcons’ line and blocked the FG attempt. Now it’s still 0-0 and momentum had swung back to the Patriots. Offense. After the FG block, the Patriots offense took the ball for its second possession. After fizzling on drive number one, and seeing its special teams unit make a play, a three and out is not something that is to be tolerated if you’re a team with high standards. The Patriots offense furthered the momentum swing of the blocked FG with a nice drive culminating in a TD and 7-0 lead. Defense. Near the end of the first half, with the Patriots leading 10-0, the Falcons had a nice drive going that stalled; the Falcons now faced a 4th and 6 at the Patriots’ 47-yard line. The Falcons, inexplicably, decided to go for it. If the Patriots defense could make a stop, their offense would get the ball near midfield with three timeouts left and nearly two minutes on the clock. The Patriots defense followed through with a stop, the offense came on the field and converted for a TD and what felt like an insurmountable 17-0 lead. Belichick’s team completely controlled this game – start to finish, and play to play. There weren’t any lapses. 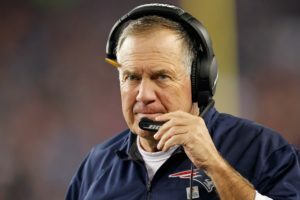 It’s not something we see often, and since we did in this game, Bill Belichick is this week’s Top Dog.